iMacsoft Apple TV Video Converter is professional Apple TV video converter software designed just for Windows users to convert most popular videos such as AVI, DivX, XviD, WMV, MPEG, DAT, VOB, RM, RMVB, MOV, ASF, etc. to Apple TV video format MP4, MPEG-4, H264. Otherwise, iMacsoft Apple TV Video Converter can also convert popular audio files including WMA, MP2, OGG, RA, AC3, CDA, etc. to Apple TV MP3, AAC, WAV. What's more, iMacsoft Apple TV Video Converter can also convert video files to iPad, iPod, iPhone, common video and common audio formats with ease. 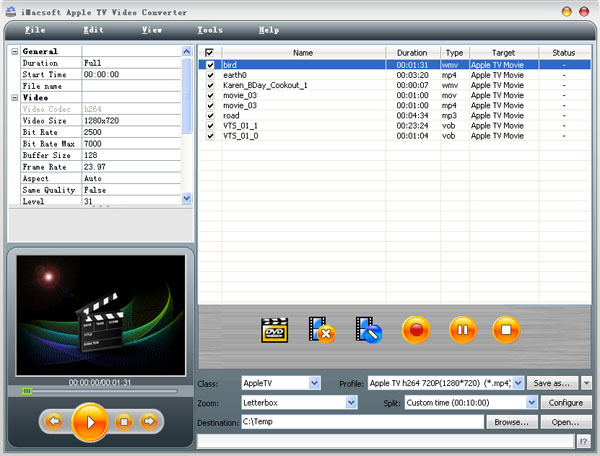 iMacsoft Apple TV Video Converter has strong function of editing options, such as movie trimming, video and audio encoder settings, batch conversion and so on. The conversion will be finished in a few clicks, then you can put the converted video onto your Apple TV for you to enjoy at home. Now free download and try this powerful iMacsoft Apple TV Video Converter software and enjoy your favorite movie clips on Apple TV with full HD quality. How to convert AVI video to Apple TV? How to convert AVI to Apple TV video MOV format? How to convert MPEG to Apple TV video? How to convert FLV video from YouTube to play on Apple TV? How to convert MKV video to Apple TV MP4?